WXXI's Karen DeWitt reports that the candidates in the New York gubernatorial race have differing views on single-payer health care in the state. 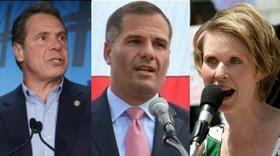 Single-payer health care for New York has become an issue in the race for governor. Democratic primary challenger Cynthia Nixon say if she’s elected, she’d enact single-payer for New York. Not all of her opponents think that’s a good idea.